Yesterday at sundown marked the first day of Hanukkah, the Jewish celebration of lights. This holiday lasts for eight days, and it marks the re-dedication of the Temple of Jerusalem by Judah Maccabee after its desecration under Antiochus IV. Beginning at sundown on the first day of Hanukkah a candle is lit, and each night thereafter, the number of candles lit is increased by one. 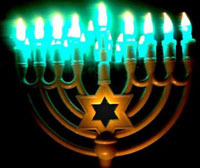 One extra candle, called the shamash, or servant candle, is also lit and placed higher or lower than the other candles. The shamash is used to light all the others, because the Talmud prohibits using the Hanukkah lights for anything other than publicizing the Hanukkah story. By the end of Hanukkah forty-four candles will be lit. So happy Hanukkah! Just in case you don’t know anyone who’s Jewish, here’s a little song by Mr. Adam Sandler to help familiarize you with some of our Jewish brethren.